i know i am most definitely not alone in my love of pinterest and i'm also certainly not the only one spending tons of time (maybe too much...hee,hee) finding yummy recipes, home decor ideas and crafty inspiration too. i saw this amazing piece of art by lana gordon rast on pinterest and i was so delighted! 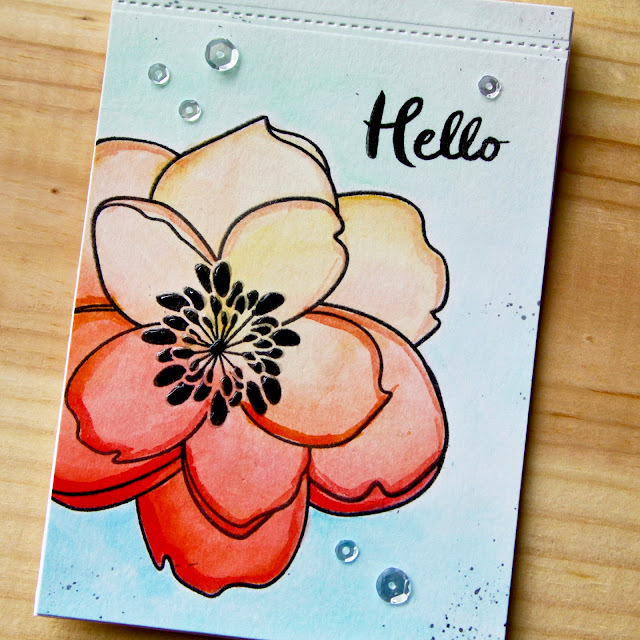 i couldn't wait to create a watercolor card with the same beautiful colors! -i started with a 4-1/4 x 5-1/2 piece of watercolor paper and on it i stamped the magnolia from the essentials by ellen clear stamp mondo magnolia in versafine oynx. 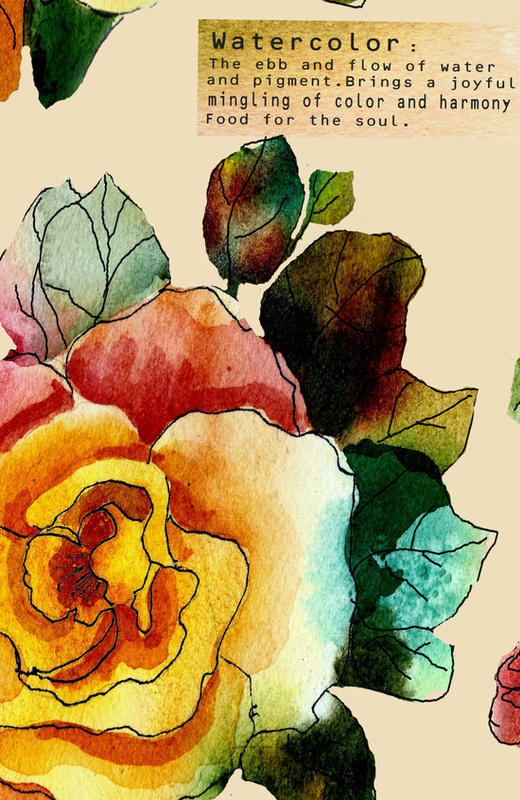 -i started at the bottom of the flower with distress ink abandoned coral and blended in spiced marmalade ink as i moved up. when my first layer dried, i added more ink to the edges. -next i watercolored the background with a very light wash of distress ink cracked pistachio and peacock feathers. 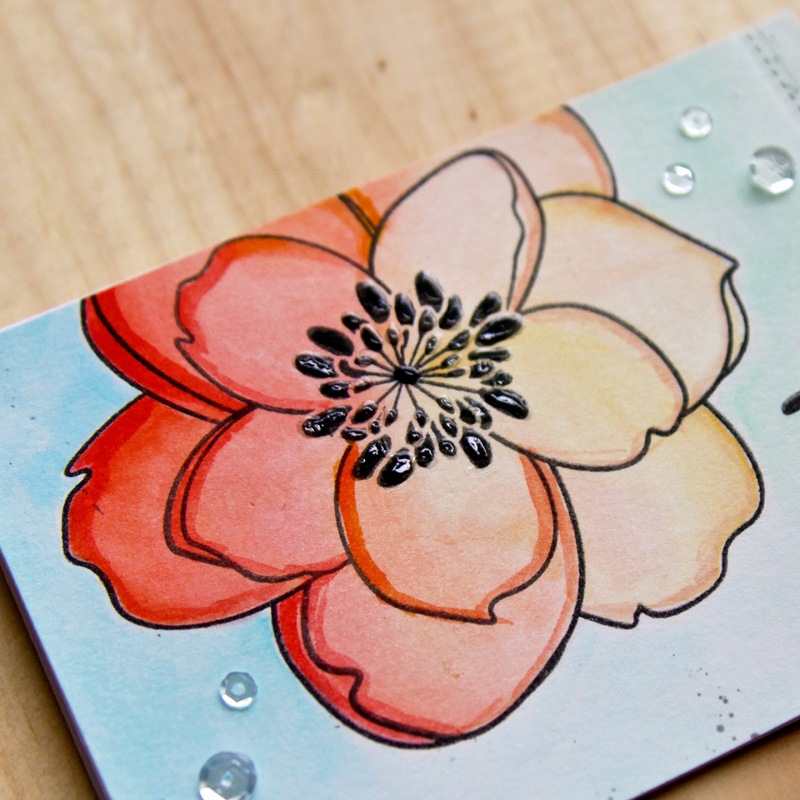 -when the all of the ink was dry i added glossy accents to the flower center. -then when the glossy accents was dry, i decided it needed a little faux stitching so i used the straight stitching die from the new my favorite things basic stitch lines die set across the top. -i finished with a sentiment from the essentials by ellen clear stamps hello gorgeous set and some clear sequins. and i adhered the panel to a folded solar white card. 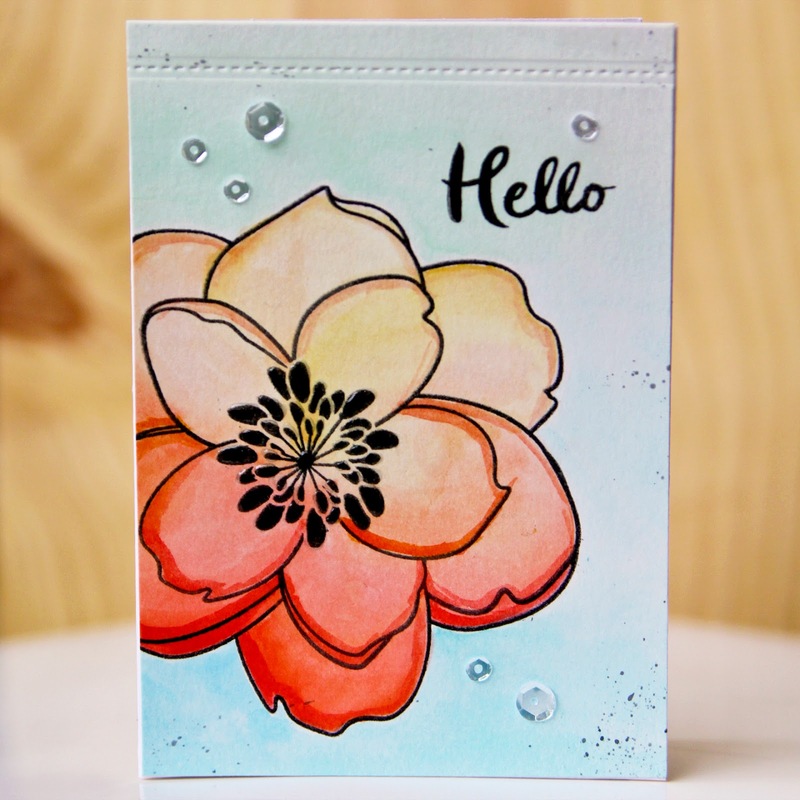 Love seeing how you were inspired...your card is simply beautiful! Hi Carly!! I can't see a place to contact you. I'm hopping in the Ellen Hutson release today and I didn't want to double comment there. I would love to subscribe to your blog by email, but I don't see that option here either. I hope you go to the dashboard of your blog and add it soon!! Please....and thank You! As, I would love to follow you. And I enjoy getting posts right into my email box. Thanks! Paulette S.
since Google can't remove my Blogger profile with closed email address for a blog that is no longer here!!! And makes me have to type all of my info in the comments section, subjecting myself to more spam than is necessary! I just came across your blog. Thanks so much for your kind compliments on my art. I am glad to hear I inspired you with my art. Your take on it was inspiring too as you did your own thing like a true artist. You were inspired to create a peace of beautiful art while making it totally your own.